Clear Glass Schoolhouse Sconce Bronze 1 Light 6 Inch Width Neuvelle bronze finish sconce with Roseway schoolhouse style clear glass. Takes one 60-watt medium base clear light bulb (not included). Suitable for installation in dry and damp locations. This sconce can be installed with the glass facing down only. 120 volts line voltage. UL / CUL certified. 9.125 in x 6 in x 7.75 in. 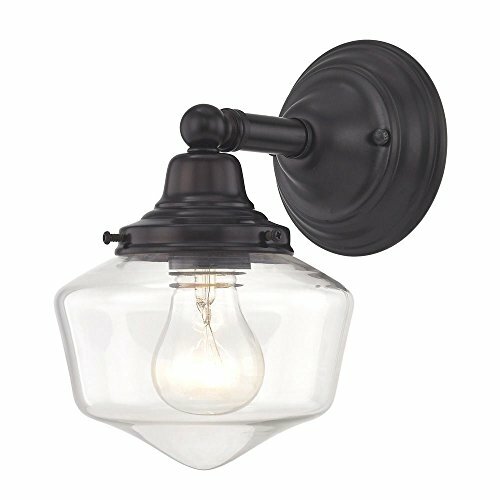 Design Classics Clear Glass Schoolhouse Sconce Bronze 1-Light 6 Inch Width - Steel Wall Fixture - 9.125 in X 6 in X 7.75 In.